There are a lot of small factories in Japan that, at first glance, might not seem like they remaking anything important, but if you look closely, you’ll realize that some of these factories are producing important parts used in the most innovative and advanced fields, such as scientific research, medical research, and space exploration. These small factories create parts that make up the products that Japan’s world-famous corprations market. But a lot of the times, these companies are contractually obligated not to reveal what parts they make for which companies. As such, some of these small companies have found ways to promote their unique skills by producing and selling their own products. Today, I would like to talk about a special mirror that was designed and put together by three small companies. Individually, these companies just make parts, but collectively, they can create a whole product. This mirror was specifically designed for making teeth brushing easier. The mirror in the center is a magnifying glass, which magnifies the inside of a mouth 1.5 times. The mirror is made of plastic and does not break easily like glass, so it is safe for children to use. On each side of the mirror, there are LED lights placed to light up the inside of the mouth. These days, portable sonic vibration toothbrushes are popular in Japan, and a big percentage of the consumers are women, so a lot of these stylish toothbrushes are designed to look like a cosmetic product. This mirror is also designed for optimized portability, with its compact size. The biggest feature is its curved frame shape designed to match the curved mirror. The backside is also curved in, so that even though the frame does not have a lot of space to hold onto, the mirror fits nicely in your hand and does not fall out of your hand easily. This product is a perfect example of the innovative ideas and craftsmanship of the humble small companies that support the big name brands. Hi, I’m Takahiro Hirakawa, a product designer based in Tokyo. I was asked to write a piece on product design for this first issue you’re holding in your hand, and after thinking long and hard about what to write, I decided to write a little about what goes through my head when I do designs by giving you an actual example. 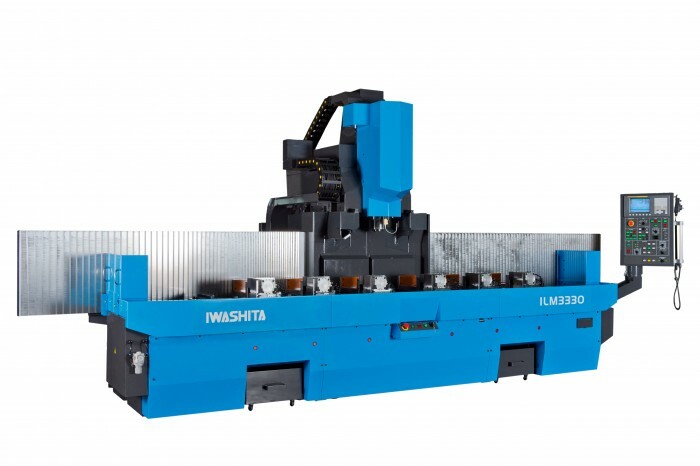 Here’s one: I was recently commissioned to design the ILM3330, a long work-piece NC processing machine for Iwashita Industrial Co., Ltd. The main target market was East Asia and the concept was “low cost.” I’d normally start by analyzing the market before sketching out designs, but for certain reasons it was hard for me to do that at the time, so I decided to ask as many questions as I can to my client. This is something I do sometimes: bombard them with questions after questions to get a good idea of what I’m dealing with. I’m sure some of them have thought to themselves, “What on earth does that have to do with anything?” after hearing some of my questions. I tried to get as much information as I can, and as a result, I found out that they’ve been getting a lot of requests such as “we want low price over quality,” or “we want the cheapest option possible so we don’t need that cover” from their customers. It seems the customers in East Asia care more about keeping the cost low than customers in Japan. Thus, I decided that “keeping the cost as low as possible” is the key theme for this particular project. But at the same time, as a Japanese brand, lowering the quality was just not acceptable. So, I suggested we go with a “low priced styling.” If we wanted to make it as cheap as possible, there were easier ways. But it’s not worth it if it devalues the product. Just because it’s cheap, doesn’t mean it has to look cheap. Also, the product needed to be identifiable as an Iwashita product. So, I decided to give the cover of the tool, which is the most important part of the machine, a distinctive design. After researching the trend in big brand machine tools around the world, I discovered that a lot of them feature a round shape. So, I figured that by giving it a kind of sharp edgy design, we would have a product that keeps the cost low, while also standing out from the rest. And the design is not just straight and sharp for the sake of it; it symbolizes the precision of Japanese brand machine tools. And thus, the ILM3330 was born.